About 14 species, natives of the northern hemisphere and the Andes of South America. Besides the following, some 4 others occur in western North America. Type species: Alnus vulgaris Hill. Nut bordered by a membranous wing on each side. Leaves obovate, broadly oval or suborbicular, dull; aments expanding long before the leaves. Leaves finely pale-tomentose or glaucous beneath. Leaves green and glabrous or pubescent beneath, obovate to suborbicular. Leaves dentate-serrate; twigs glutinous; introduced tree. Betula Alnobetula Ehrh. Beitr. 2: 72. 1788. Alnus viridis DC. Fl. Fr. 3: 304. 1805. A. crispa Pursh, Fl. Am. Sept. 623. 1814. A. Mitchelliana M. A. Curtis; A. Gray, Am. Journ. Sci. 42: 42. 1842. Alnus Alnobetula K. Koch, Dendr. 21: 625. 1872. 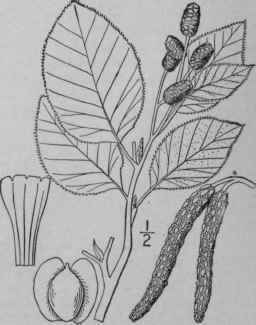 Alnus mollis Fernald, Rhodora 6: 162. 1904. A shrub, 2°-10° high, the young leaves glutinous and more or less pubescent, the twigs glabrous or pubescent. Leaves oval or ovate, obtuse or acute, sharply and more or less irregularly serrulate or incised-serrulate, when mature dark green and glabrous above, light green and glabrous or pubescent beneath, 2'-5' long, 1 1/2' - 3' wide; petioles 4"-12" long; aments expanding with the leaves, the staminate slender, naked, 1 1/2'-2 1/2' long, the pistillate oblong or ovoid-oblong, slender-peduncled, becoming 4"-10" long and 4"-5" in diameter in fruit, their bracts irregularly 5-toothed; nut oblong, the thin wings about as broad as the body. Newfoundland to Manitoba, Massachusetts, New York, Michigan, and in the higher Alleghanies to North Carolina. Also in Europe and Asia. June. Consists of many races, differing mainly in the amount of pubescence.